Named “Seduction’, the flabbergasting Diane von Furstenberg fall/winter 2015-2016 rtw collection kicked off to the soundtrack of “50 Shades of Grey’ with Kendall Jenner opening the show in a classic white wrap dress with a black belt enhancing the waist line. 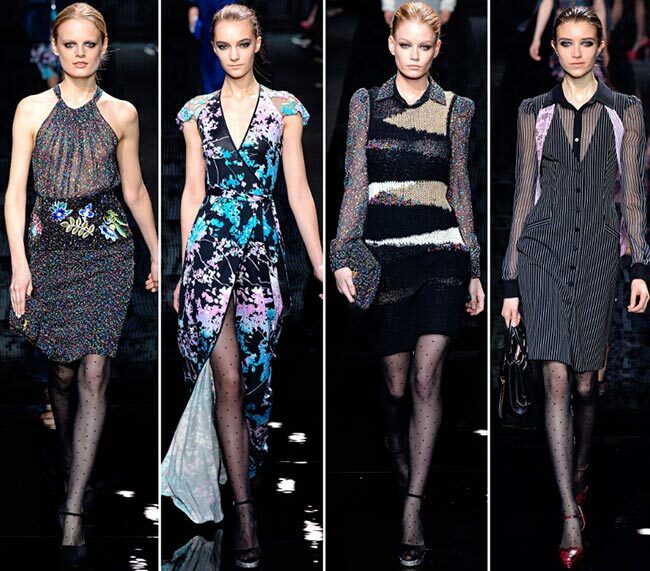 It is a diverse and powerful collection that is 50 shades of femininity, sophistication and boldness, one that targets the modern DVF woman, who “commands her world’ by day and “inspires fantasy’ by night. The entire show was an ode to youth, according to the talented designer, who was encouraging to live it fully to have something to remember later on. She tells a story of two contrasting personalities through her collection ” one young girl, who slips into pretty dresses devoid of aggressive sexuality or vulgarity, and a mature woman, who emphasizes her elegance wearing pinstripe separates, strong suits and coquettish evening dresses with peekaboo bodices in fine lace. Timeless black and white was the theme of the beginning of the show, when we witnessed some elegant dressing, from Diane’s iconic wrap dresses to pinstripe ensembles with delicate masculine references and printed coats worn as dresses with dotted black tights and platform heeled shoes. We are used to being treated to a big dose of femininity at every DVF RTW show and this particular one also didn’t lack it, still managing to skillfully fuse it with notes of androgynous fashion. Exactly the latter did look the strongest and coolest in the entire line, revealing a completely new side of the DVF woman, who’s classy, self-confident and who knows how to channel femininity wearing a pinstripe suit. 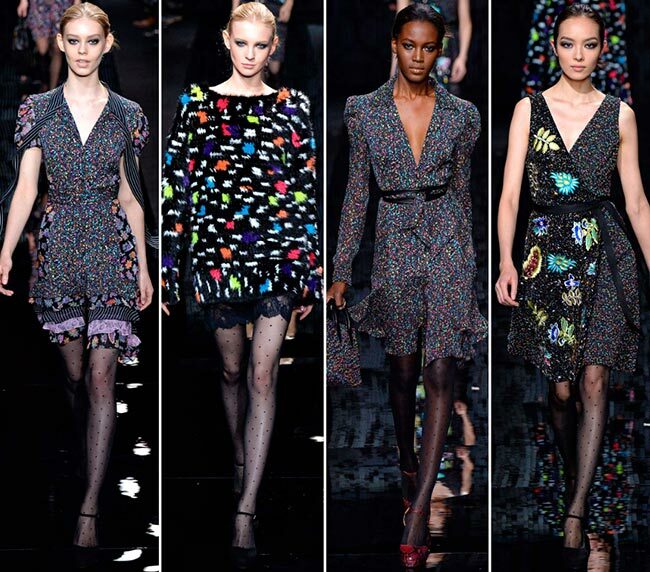 Then the mood of the Diane von Furstenberg fall/winter 2015-2016 collection drastically changed and an array of flirty floral printed dresses hit the runway using the shades of lavender and purple with black and a small proportion of brights. A flirty printed chiffon dress was embellished with the same pinstripe pattern used for strips of fabrics applied on the neckline or the delicately ruffled hemline for creating a beautiful contrast with the feminine patterns. We also saw interesting texture combinations, when knitwear was skillfully blended with printed chiffon giving warmth to it. Outerwear was as classic and statement-making as the beautiful dresses and separates showcased and some of them were chic enough to be donned on a naked body, acting as a designer dress with a great attention to details. 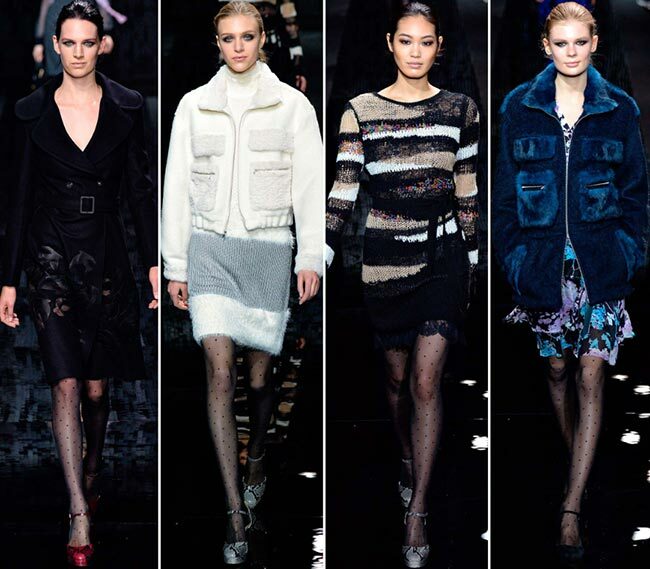 Luxurious furs were used for zip-up jackets to enhance the boldness of the designs, as well as for providing enough warmth in the colder months. 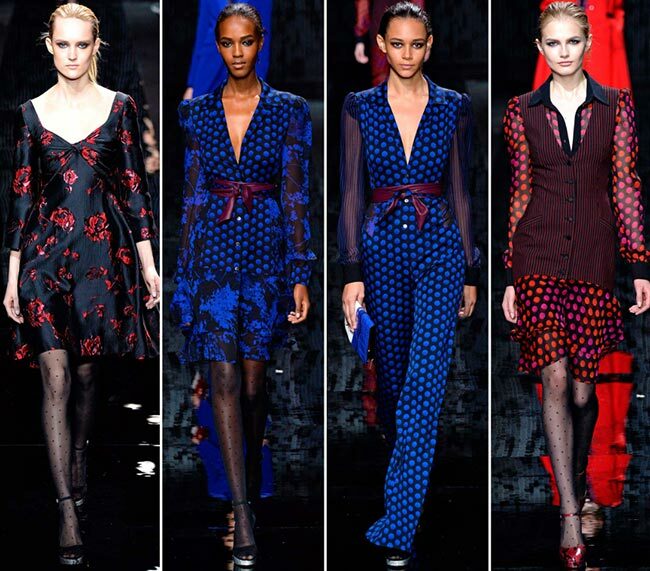 We also saw lots of eclectic blues used for a polka dotted V-neck jumpsuit, an elegant pant suit and a printed dress accessorized with a burgundy leather belt. Amidst this range of pieces, we spotted an elongated design of Diane’s wrap dress looking so opulent and soft thanks to the floral prints used. Passionate red was the next shade used, which came mixed and matched with burgundy or black for creating a beautiful contrast. 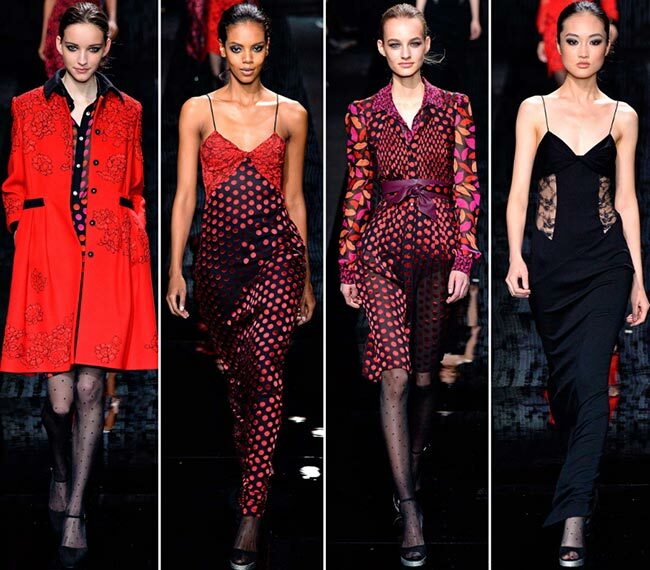 In this array of pieces lots of delicate lace, appliqués and iconic DVF red lip prints were used to increase the dangerous and whimsical mood of the absolutely to-die-for pieces. As the show was coming to a close, a parade of luxurious eveningwear options hit the runway, including floor-length slipgowns, a black tuxedo dress with lace details and quite revealing lace dresses with plunging necklines. All the outfits were accessorized with black tights, classy heeled shoes and clutches, while the elegant updos and the smokey eyes came to make the overall looks complete and just picture perfect!